Did you get a firm “No” when you asked your crush if… she’d be free to, you know, if she didn’t already have a date… maybe go to prom with you? Or maybe tremors from a questionable seafood buffet surfaced during the back-to-front photos, sending you to the bathroom for the next two hours? Was it a wardrobe malfunction, a drunk best friend, an unfortunate hairstyle, or maybe a slightly too-ambitious break-dancing incident…? No matter your prom trauma, you can rewrite your story at Prom: The Sequel! We’ll be playing prom favorites through the decades all night, so come dressed in the formal wear you wish you’d worn back then! A discounted group rate is available for groups of 6 or more–invite your friends and join us for an incredible night! 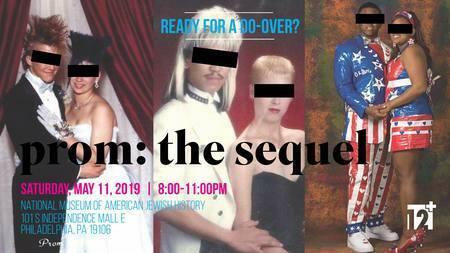 All ticket sales and proceeds raised at Prom: The Sequel will support 12 PLUS and Philadelphia high school students.